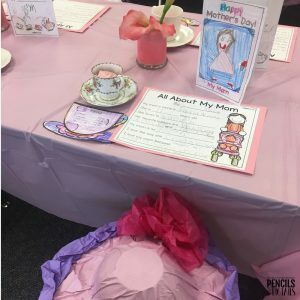 The Mother’s Day Tea was a Success! 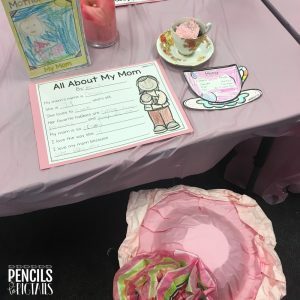 Back again to share with you how the Mother’s Day Tea went. 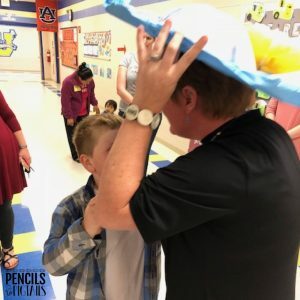 I am pretty sure that it was the most meaningful and touching thing I’ve EVER planned as a teacher. Let me start at the beginning. 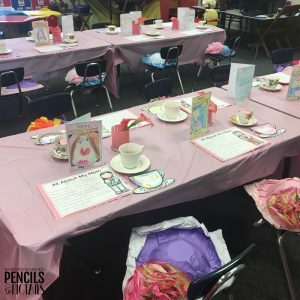 Mother’s Day Tea – A Unique Way to Celebrate Your Students and their Moms! 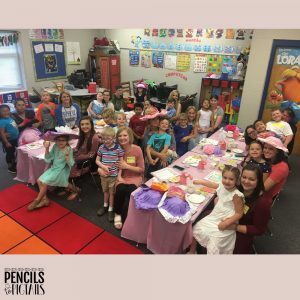 Most of the moms were able to attend the tea. I asked our vice principal and reading specialist to stand in for the 2 that weren’t able to. We also practiced singing a couple of songs (Skinnamarinky-dinky-dink… & the song from Barney “I love you, you love me….”). 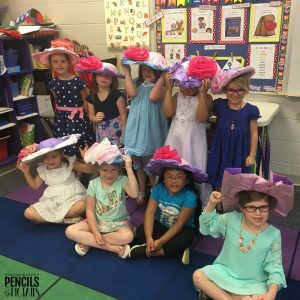 The kids helped me set the tablecloths out and put the hats on the chairs. AND THEN I had my assistant take them outside to play for about 30 minutes while I finished setting up. I told them to be careful outside because I had asked for them to be sent in their “Sunday Best”. (See post linked earlier.) If you plan one, you will definitely need to enlist some help from a couple of people. -Preferably not the moms so you can surprise them! 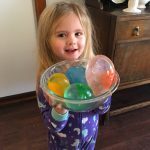 Another assistant helped me cut up some fruit and boil the water for tea. I bought an electric tea kettle about a month ago and that worked perfectly! See the little animal pitchers? 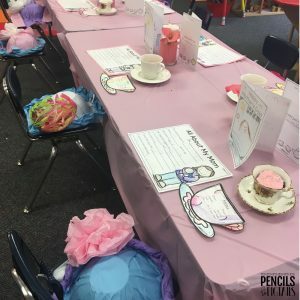 The kids were instructed to come tell us if their mom wanted hot tea so we could safely carry it to them, but the little animals were at each table and the children loved pouring cream in for their moms. 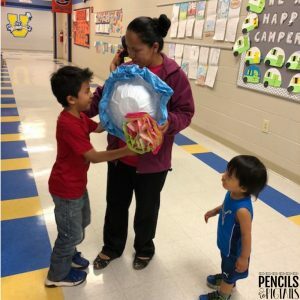 When everything was ready, the kids answered the door one at a time. 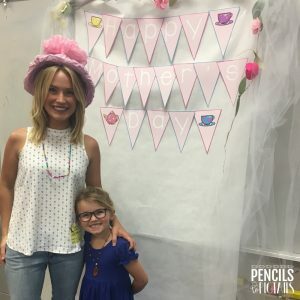 It was so sweet to see the mom’s faces when they were presented with a hat and necklace! 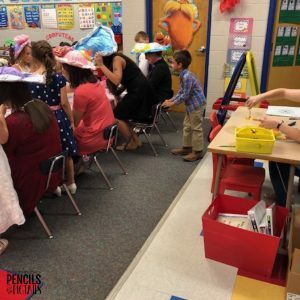 I loved this picture of one of my students pushing his mom’s chair in. Just like we practiced! 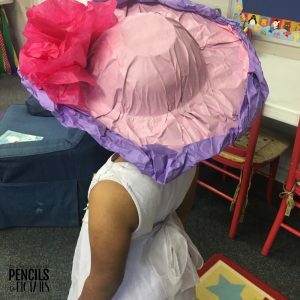 The kids had a lot of fun trying on the hats themselves! 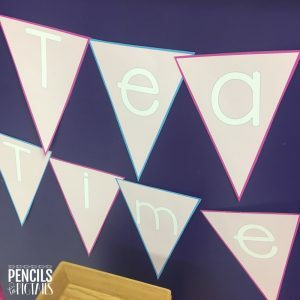 We set up a little photo backdrop using the banner in the resource on TPT. While the moms started eating, I took pictures of each mother and her child. 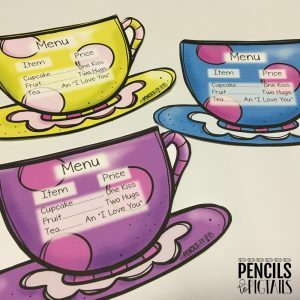 When the moms finished their tea and food, the kids came up to sing their songs and walk up one at a time and tell why they loved their mom. 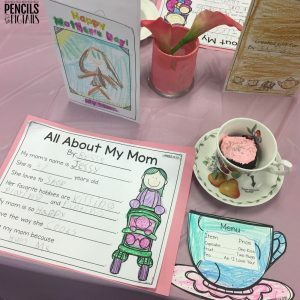 They said things like, “I love my mom because she tucks me in at night.” or “I love my mom because she loves me.” It was really sweet to hear their thoughts and I was proud of how they spoke with confidence. Finally, I read the book “I’ll Love You Forever”. The kids were in charge of saying the verse, “I’ll love you forever. I’ll like you for always. 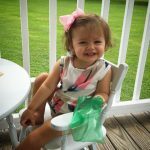 As long as I’m living, my baby you’ll be,” on each page. When I closed the book I looked out to see many of the moms crying. It was a tear jerker! 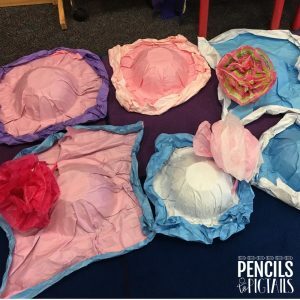 It did take me quite a bit of time to prepare it all but I was able to save the decorations to use next year and now that I’ve made the resource I can use it again and again. 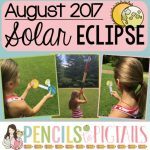 You will be able to reuse it each year too as it is an EDITABLE resource! 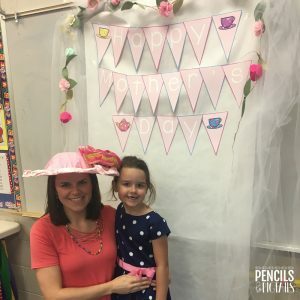 It was so worth it to me for the kids to make such sweet memories with their moms. The moms were such troopers wearing their hats and necklaces with pride. 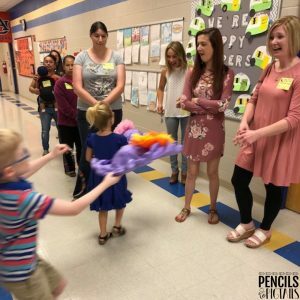 🙂 I could tell that the moms felt very loved and that was the main goal. I definitely plan on doing this every year from now on! What about you? 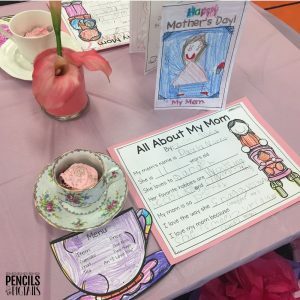 Have you ever tried a Mother’s Day Tea with your students? Let me know in the comments. 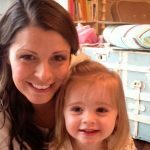 Happy Teaching and Mommy-ing this week friends! 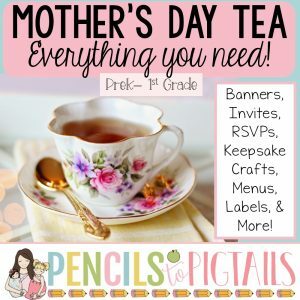 Your Mother’s Day tea party looks like such a wonderful event! 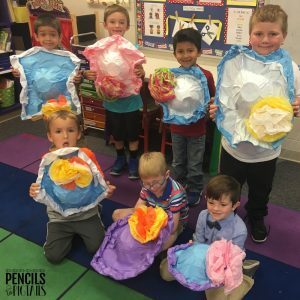 So many thoughtful touches! 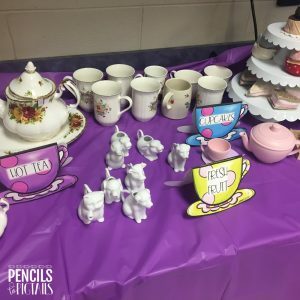 (Seeing that some of my clip art was used as part of this lovely event made me feel awesome, too!) 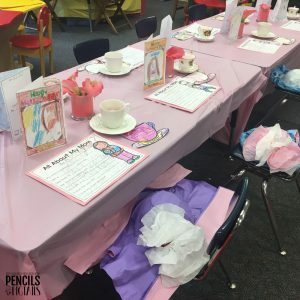 I did a Mother’s Day tea party in my class today, as well. 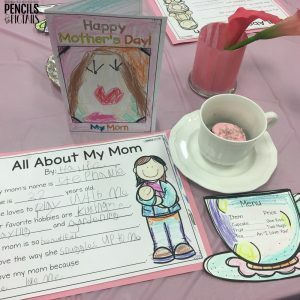 It’s a lot of work, but the moms always really appreciate it, so it’s all worthwhile. Thank you Corinne! I just saw your message. It was really special and your clip art was the perfect touch. 🙂 I can’t wait to do it again next year!